As a conversion copywriter and messaging consultant, I combine proven direct response techniques with a clear, contemporary writing style. To clearly and persuasively position your product or service as the best only option available. I work closely with a handful of clients who want to achieve that with my Selling Unique process. It’s all about communicating your true, unique value to the right people. The result is more success and growth, with far less effort and expense. At LocalizeDirect we advise app developers to maximize their global reach by translating their products into multiple languages. Peter has been helping us improve this message across our site and we’re very impressed with his ability to create compelling copy for our target audience. Peter did a great job with our initial launch… for some affiliates it was converting at up to 4%. For our own internal traffic we received EPCs well over $10, meaning we converted close to 20% from our list. Peter was super helpful and responsive. I stumbled across Pete and read a couple of awesome reviews, so I decided to bite the bullet and shell out my hard-earned cash for a copy review. I was skeptical at first… BOY WAS I WRONG! Pete looked at my FB Ads and Landing Page and made what I thought were “small tweaks”. Stuff I never would have picked up on. I launched the new funnel and my landing page now has been converting at a SOLID 69% over the past two months. You read that right… conversions over doubled! I’ve saved more than the price of admission from this massively improved conversion rate. A great investment. And Pete is a great guy to work with. A total Pro. He delivers great quality on time. After your copywriting work, we had a 25% conversion rate increase on PPC sales and 10% overall conversion rate increase from all channels for the course page. Your guidance also helped us to better communicate to students how our monthly plan works, and reduced confusion about that process. Pete was truly interested in my business and made excellent suggestions I was able to implement straight away. 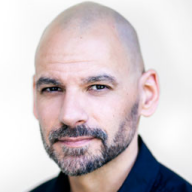 Peter Michaels is a copywriter I gleefully recommend to business owners who need a true expert. He’s plugged into the most proven methods and he goes deep with his clients to get results. That means with Pete you’re getting a writer with a 360-degree view of your campaign. There’s a whole lotta folks talking about ‘conversion copywriting’ online these days. 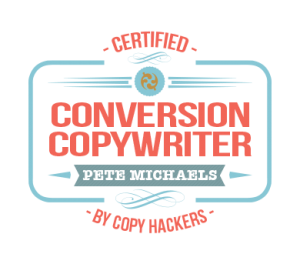 In 2014 I received certification from Joanna Wiebe of CopyHackers as a recommended Conversion Copywriter. To become a Copy Hackers Certified Conversion Copywriter, copywriters pass a rigorous exam, including multiple written assignments graded personally by Joanna Wiebe, founder of Copy Hackers and the original conversion copywriter, and Lance Jones, expert CRO. Need an expert conversion copywriter & consultant to help your biz Sell Unique? If you’d like my help with your project, just complete the request form below and I’ll get back to you inside 24 hours. So if you have an exciting product or service and need help communicating your true, unique value to your ideal customers, get in touch using the form below today. IMPORTANT: While I do consider and respond to each request I receive, I’m unable to work with everyone who contacts me. Please understand that if your messaging budget is below US $1,000 I may not be able to help with your project. Who are your customers or prospects? What problems does your product or service solve for them?